The follow up to the IBM704. Utilizing ideas learned from the Strech IBM enhanced the 704 by adding multiple communications channels to speed up processing I/O devices. This allowed the machine to continue processing while the tapes or card readers transfered data. Also this was one of the first machines to feature indirect addressing. Also added as an indicator register to hold flags and other information. The IBM 709 was announced January 2, 1957 withdrawn April 7, 1960. Originally the IBM 709T later to be named the IBM 7090 by customers, the machine was a faster version of the IBM 709 implimented in transisters instead of tubes. The IBM 7090 announced Decemeber 30, 1958 withdrawn July 14, 1969. The IBM 7090 also was built out of the same modules as the Stretch and used the same memory modules. The final enhancement was the IBM 7094, this added double percision arithmetic, faster processing, and 4 more index registers. The machine looked like a 7090 until extra indexing mode was entered, then instead of 3 registers begin or-ed together, the 3 bits selected one of 7 index registers. It was latter upgraded to the 7094/II which was still faster. IBM 7094 & IBM 7094/II, announced January 15, 1962 withdrawn July 14, 1969. 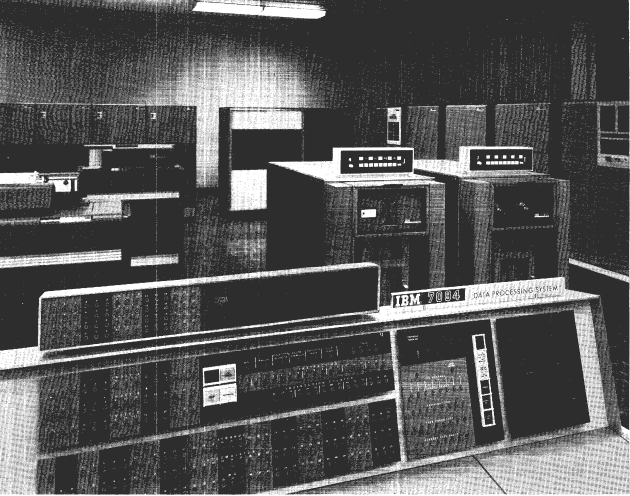 IBM also developed two transisterized versions of the IBM 704, these were slower then the IBM 7090, and did not feature an indicator register or indirect addressing. But they came optionally with double precision floating point, and special character operating instructions. It was also possible to purchase a 7040 without index registers or floating point. The machines were ment to be front ends to the IBM 7094, and a direct couple devices was sold, along with the ablity to share 1301 drives between systems. Unfortunaly no software has been found for the IBM 7040/44. The IBM 7094 was also one of the first machines to be modified to run time sharing. The Compatable Time Sharing System (CTSS) was developed by MIT to allow for the IBM 7094 to be shared by multiple people while still being compatable with IBSYS. Lisp 1.5 recovered from a listing. 9 AP. A stand alone assembler for the IBM 709, it is based off UASAP. Diagnostics recovered from card deck and scanned manuals. IBSYSMajor operating system for IBM 7090/7094.